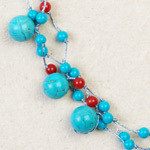 In this design by Sirada, red ceramic mingles with reconstituted blue turquoise. 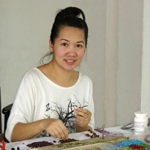 The jewelry artisan knots the beads by hand on rayon threads. 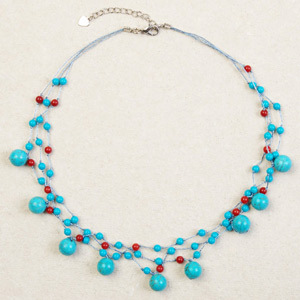 The necklace fastens with a lobster claw clasp and is adjustable in length. Materials: Reconstituted turquoise, ceramic, rayon and stainless steel.